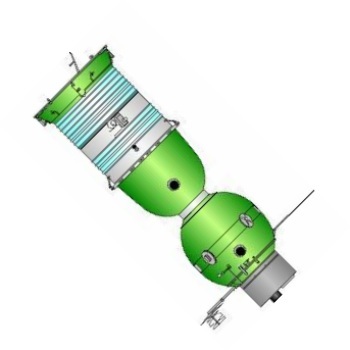 Soyuz P antisatellite interceptor (conceptual drawing based on description). Russian manned combat spacecraft. Study 1963. In December 1962 Sergei Korolev released his draft project for a versatile manned spacecraft to follow Vostok. The Soyuz A was primarily designed for manned circumlunar flight. AKA: 11F71;7K-P. Status: Study 1963. Gross mass: 6,700 kg (14,700 lb). Height: 6.50 m (21.30 ft). However Korolev understood very well that financing of the scale required could only come from the Ministry of Defense. Therefore his draft project proposed two additional modifications of the 7K: the 7K-P (Perekhvatchik, Interceptor) space interceptor and the Soyuz R (Razvedki, intelligence) command-reconnaissance spacecraft. 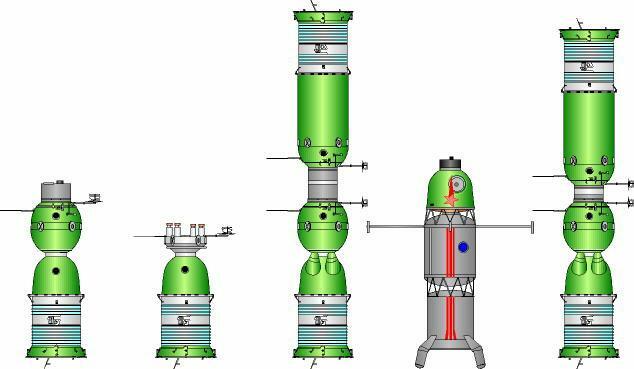 In the initial draft project, the Soyuz-P would use the Soyuz-B rocket stage and Soyuz-V tanker spacecraft and conduct a series of dockings and fuelling. The complete complex then could conduct intercepts of enemy satellites in orbits up to 6,000 km altitude. The VVS and the Strategic Rocket Forces supported these variants of the Soyuz. They were fully aware that the US Air Force's Manned Orbiting Laboratory was in the advance concept stage (it would be approved for development on December 10, 1963). But Korolev had no time to work on what were to him Soyuz 'side-lines'. In 1963 his OKB-1 was fully occupied with work on the Voskhod and N1 projects. Therefore he decided that while OKB-1 Kaliningrad would concentrate on development of the Soyuz-A circumlunar spacecraft, the military projects Soyuz-P and Soyuz-R would be 'subcontracted' to OKB-1 filial number 3, based in Samara (then Kuibishev), headed by Chief Designer Dmitri Ilyich Kozlov. For Kozlov development of military spacecraft was nothing new. In 1961 he completed the technical documentation for the serial production of the photo reconnaissance satellite 11F61 Zenit-2, and from 1964, filial 3 undertook development of the 11F69 Zenit-4 reconnaissance satellite from draft project to production. Samara was also responsible for future development and production support of derivatives of the R-7 family of launch vehicles. KB Kozlov began active development of the Soyuz-P in 1964. Initially the Soyuz-P was designed for piloted inspection and destruction of enemy satellites. It was intended that the Soyuz would rendezvous with the target satellite. The cosmonaut would then exit the spacecraft and inspection of the satellite. Depending on the mission and results of the inspection, the satellite would then be destroyed, neutralized, or returned to earth for further study. This approach was quickly rejected due to its multiple technical complexities and the obvious danger to the cosmonaut. All Soviet satellites were equipped with automatic destruct systems to prevent them from falling into enemy hands. These would go off if given parameters were met, even when not in radio contact with Soviet ground control. There was every reason to believe that the enemy used similar systems in their satellites. Therefore it was believed that this approach would only result in the death of the cosmonaut. The revised successor design was designated the 7K-PPK. Crew Size: 2. Habitable Volume: 13.00 m3. Family: Combat spacecraft. Country: Russia. Launch Vehicles: R-7. Agency: Kozlov bureau. Bibliography: 102, 121, 272, 376, 6908. Soyuz draft project completed. - . Nation: Russia. Program: Soyuz. Spacecraft: Soyuz A, Soyuz B, Soyuz P, Soyuz R, Soyuz V. The draft project for a versatile manned spacecraft included the Soyuz-A circumlunar spacecraft, the military Soyuz-P fighter and Soyuz-R reconn bird..
1963 March 20 - . 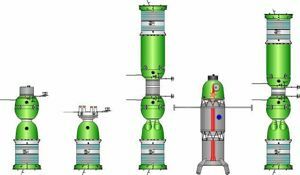 Soyuz draft project was submitted to the expert commission - . Nation: Russia. Spacecraft: Soyuz A, Soyuz B, Soyuz P, Soyuz R, Soyuz V.
Aside from the baseline Soyuz-B circumlunar mission, the draft project also proposed the Soyuz-P space interceptor and the Soyuz-R command-reconnaissance spacecraft. The military projects Soyuz-P and Soyuz-R were 'subcontracted' to OKB-1 Filial Number 3, based in Samara. The Soyuz B circumlunar version did not receive the same level of financial support. 1964 Duing the year - . Launch Vehicle: R-7. Development of Soyuz-R and Soyuz-P begun. - . Nation: Russia. Related Persons: Kozlov. Program: Almaz. Class: Manned. Type: Manned spacecraft. Spacecraft: Soyuz 7K-TK, Soyuz P, Soyuz PPK, Soyuz R.
KB Kozlov began active development of the military applied versions of the Soyuz. A new version of the R-7 launch vehicle, the 11A514, was put into development to support launch of the Soyuz-P, now designated the 7K-PPK (pilotiruemovo korablya-perekhvatchika, manned interceptor spacecraft). The Soyuz-R would include the small orbital station 11F71 with photo-reconnaissance and ELINT equipment. To dock with the 11F71 station Kuibishev developed the transport spacecraft 11F72 7K-TK. This version of the Soyuz was equipped with rendezvous, docking, and transition equipment, including an airlock, that allowed the two cosmonauts to enter the station without using EVA. The launch vehicle for the 7K-TK would be the 11A511, known today as the Soyuz. Military Soviet of the VVS Staff - . Nation: Russia. Program: Lunar L1. Flight: Soyuz A-1, Soyuz A-2, Soyuz A-3, Soyuz A-4. Spacecraft: Soyuz A, Soyuz P, Soyuz PPK, Soyuz R.
No significant decisions are made. Discussion of the 3 December 1963 resolution to start development of the 7K Soyuz spacecraft. Although the resolution foresees completion of the first spacecraft during 1964, and first flights in 1965-1966, there is not one word on training of cosmonauts for such missions. Scientific versions, for manned flight to the moon and planets, as well as military variants, are foreseen.